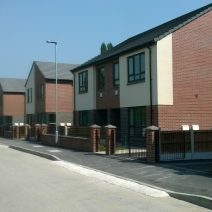 The site is located in the Baguley area of Wythenshawe being a very long and narrow area sitting alongside the railway in close proximity to Baguley Park. This development will see the construction of Forty No. two bedroom two bathroom apartments for affordable rent and 30No. 2, 3 or 4 bed houses for shared ownership. Completion is expected October 18.